One of the top three questions readers ask is, “Should we get travel insurance?” Spending money on insurance when it could be used for the vacation itself makes this expenditure a tough choice. Of course, for people over 65, travel insurance plans make more sense due to chronic illnesses that can interrupt travel and the increased risk of injury from falls. For families, though, is travel insurance worth it? When I first started this site, I didn’t purchase travel insurance and I really didn’t recommend it. A lot has happened these past two years to change my mind. On a cruise last November, one of the passengers got violently ill and had to be transported to a hospital in Nassau. United States health insurance plans don’t always cover expenses out of country. Even if medical insurance covers the illness, it won’t cover the cost of hotel expenses for family members or transportation back to the United States. Sadly, on a cruise in January, one of the other passengers died. We want to think we’re invincible. We certainly don’t want to imagine we could die on vacation, but (sorry — just being honest) it happens. Sometimes to younger people. As I write this, a dear lady I know is preparing to bury her oldest son — who died suddenly of a heart attack two days ago. Your health, homeowners, and automobile insurance will not cover expenses to transport a loved one back to the United States. International shipping of a loved one currently costs at least $3840 plus the cost of a ticket. Those are worst case situations, of course. Serious illness, injury or death on vacation is both emotionally and financially devastating. For international travel, I was convinced a while ago to invest in travel insurance. Do I need travel insurance for domestic travel? Beyond illness and injury, weather and other travel interruptions (canceled flights anybody) can seriously impact a vacation. Travel insurance protects against such interruptions. If weather interrupts your vacation like Hurricane Arthur did over the July 4th holiday when the Outer Banks of North Carolina faced mandatory evacuations, you can recoup losses. If your flight is canceled or travel is interrupted, travel insurance covers expenses that the airlines won’t, including reimbursement for days lost. Do you need travel insurance for domestic travel? That’s a judgment call only you can make. Does the area I’m visiting tend to be impacted by serious weather during the time I’m traveling (east and southern coasts during hurricane season)? Do I tend to run late (which means I might well miss a flight)? What are the ages and general health of the travelers in your group? Does your car, if taking a road trip, run reliably? Travel insurance will help you recoup losses if weather, death or sudden traumatic injury interferes with your travel plans. However, it doesn’t cover everything, as the good people over at NBC news point out. Trip interruption for acts of war. Luggage lost for less than 24 hours — and only on outbound flights. Death or illness of a pet — whether the pet gets sick at home or is with you on vacation. Loss of keys, money, tickets, or credit cards. These are considered valuables which you should keep on your person at all times. To be fair, from the insurance side of things, how could anyone definitively prove or disprove a loss of cash anyway? Injuries obtained on a sporting adventure, including things like whitewater rafting, paragliding and zip lining. To protect your safety in these situations, travel with reputable companies. Pregnancy complications or childbirth are generally excluded — so read the fine print carefully if traveling while pregnant. Emotional illness or mental breakdown. Travel interruption because your spouse files for divorce. Like #5 this could be easily abused… We don’t want to take the trip, so let’s file for divorce. We can withdraw after funds are reimbursed. Well, you get the idea. Your tour operator cancels on you. Travel insurance is designed to protect you when you must cancel a trip, not the other way around. When booking travel, work with reputable companies who offer full reimbursement if they must cancel. Otherwise, you’ll be out of luck if they go belly up. When I travel internationally, I will get travel insurance — even if I’m cruising. But, traveling domestically, I consider whether my reservations (airfare, hotel, etc) are refundable if canceled. I look at the benefits my credit card company provides if travel is interrupted (all cards are different, so look at the benefits your card offers before you travel). Also, for longer trips, I contact my health insurance to learn coverage in a particular area (they are great at recommending things ahead of time, just in case). So there you have it — I still haven’t given an absolute answer. Sorry about that — it’s just not that cut and dry. I do hope these guidelines help, though! Tell me — what do you think about travel insurance? Worth it or not? This post is sponsored, but all opinions included here are my own. To learn more read my disclosure policy. Now days travel insurance making a big point at the time of travelling that is now making a big debate on travel insurance. Well said about to travel insurance. Great post! Through my credit card, I used a travel agent that offered travel insurance for a wonderful price. Something like 5% of the trip or 1 day’s worth of drink package. When thought of that way, I couldn’t in good judgement refuse it. I’ve seen too many people wind up in the hospital just days before a big trip and have to cancel or suffer through. If they had insurance, it wouldn’t have been an issue. Like you, I believe destination and travel method are important to the decision. My last two cruises had passengers with medical emergencies. I hope they had travel insurance. This is a great post indeed. I didn’t even think to have travel insurance but now that I think about it I have heard of it. I will have to check this out for sure and share this with my sister who travels a lot. Thanks for sharing. It’s not expensive, thankfully. And well worth the peace of mind. At least for us! I am looking forward on trying this one, but needs more info about it in our local place. I glad you shared this. I am still up in the air on this myself. You have good points. I can definitely see how travel insurance would come in handy. This was really in depth! I’ll have to consider my options for my next trip. Thanks for that compliment. My goal always is to present the information clearly so that you can assess the information for yourself. I hope that’s what I did here. 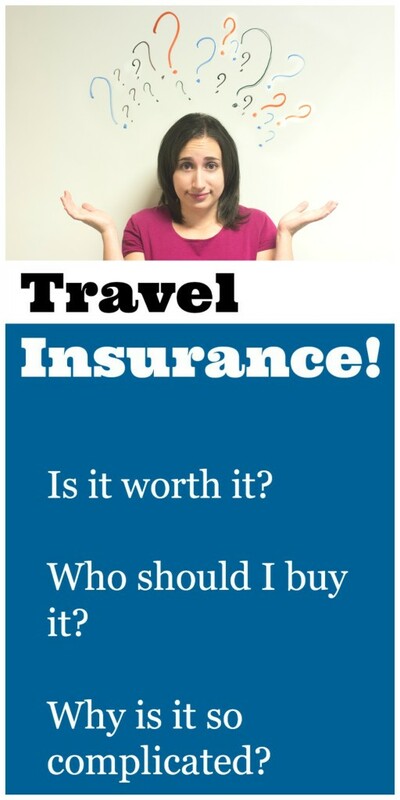 I’ve always wondered about travel insurance and how it will benefit me. I guess the bottom line is, it would depend on my destination. We are taking a cruise for our 25th anniversary in October — so still hurricane season. We have trip insurance for that one! I’ve never used it. I travel mostly within a 10 hour distance. It just doesn’t seem necessary for the little trips I take. But if I ever get to go on a cruise I will probably buy it. I’m much the same way. For most inexpensive, domestic travel, I don’t get it either. If we saved up for a major splurge vacation, though, I would get it even in the US.